Konnichiwa to our TokyoTreat family! To start, we want to thank every single member of our TokyoTreat family. It is thanks to you that we have such a loving community that inspires us to better our service as much as possible! We are always listening to feedback and are trying to continuously improve. Thanks to all the social media comments, e-mails to our customer service, and other forms of feedback, on November 6th we are able to take TokyoTreat to the next level so you all can continue to receive the best Japanese snack box experience! Check out our new video to see just how much we leveled up! Starting with our December 2017 box, we will introduce two new improved box plans that were made with you in mind. 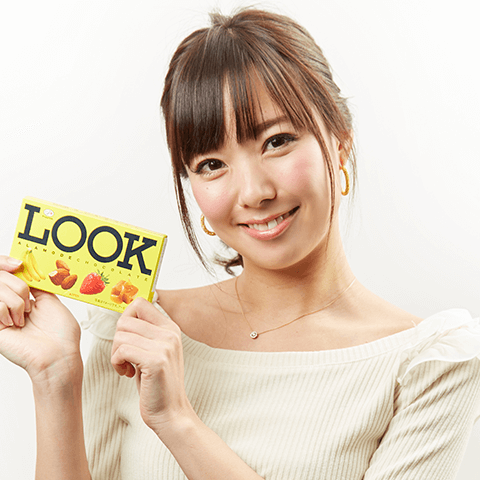 Our aim with these new plans is to ensure you only receive the best quality snacks that Japan has to offer! Going forward we will only have two plans, the Premium and the Classic. The Classic plan will replace the current Regular plan, while the Small plan will no longer be available. The Premium will offer 17 full-size, full-flavor items that includes new share packs, party packs, anime snacks, and kinosei snacks! The new Classic plan will offer 12 full-size, full-flavor items that includes new share packs and kinosei snacks! Party packs! Many of our TokyoTreat family members asked for these, and we listened! Premium plans will now include large snack-filled party packs every month. In Japan, many of the seasonal or unique flavors come only in larger packs, so now you can experience more of Japan’s stand out flavors in your box! Share packs! Tons of comments sent our way requested snacks that can be shared. To answer those requests, both plans come with share packs, Japanese snacks that have multiple individually packaged bags. Now can snack on these with friends and family easily! This also allows us to pack more flavor variations into every month’s snack box! More variety! We want your snack box to contain bigger satisfying snacks, so we are switching out the dagashi bags to allow for more exciting popular larger snacks (like Pocky, Kit Kat, Calbee, etc.) and anime themed snacks every month! Worry not! Dagashi will still make an appearance in the Japanese snack box! Kinosei snacks! Kinosei snacks are Japanese snacks made to not only taste good, but to also provide a healthy benefit. Some examples of such snacks are gum that improves your memory, and cough drop Kit Kats that can help cure a sore throat! Get ready to feel powered up after your snacking session! Adding these new snack categories allows us to provide even higher quality boxes with more variety of exclusive Japanese flavors. As you can see above, we have some very exciting changes! Also, here are some of the many popular, tasty brands that you will find in your new monthly snack boxes! 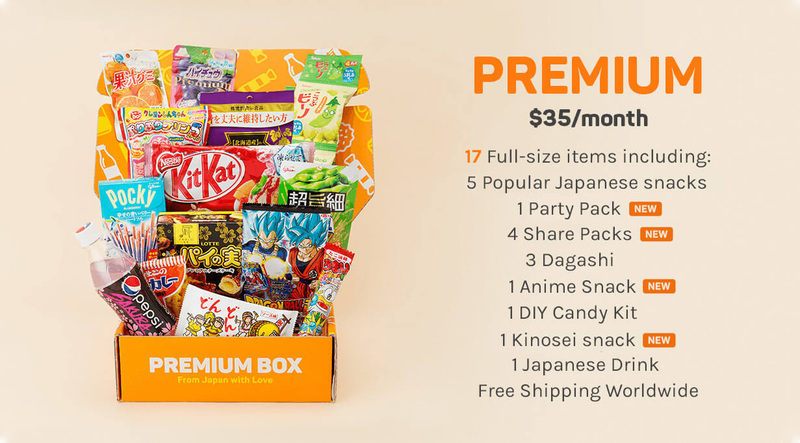 Our goal is to provide a box every month that surprises you with how many high quality, flavorful Japanese snacks are inside! We are confident that every bite you take of the snacks inside these new boxes will express the love and care put into curating your special Japanese snack box! To help with the ease of using our subscription boxes, we are changing the prices of the improved plans to a flat rate. For our monthly subscribers with the current Small box plan, you will keep your current price and will receive the new Classic plan box until the end of the year. For prepaid subscribers with the current Small box plan, you will receive the new Classic box for all your remaining boxes. Get ready to experience all the snack goodness! And, no worries, it's on us! As of 12:00 AM 1/1/2018, all Small plan subscribers will be upgraded to the Classic plan and it’s pricing plan. If you have a forever coupon, that will still be applied to your account! To celebrate this new upgrade, we will offer a 10% off your first box promotion using the code WELOVETT from 11/6 - 11/30. Better yet, want a free box!? We've revamped the refer program and increased the rewards. Now all you need to do is refer three friends to TokyoTreat for a free box from your current plan! Sweet, right?! One big change you will notice right when your delicious Japanese snacks arrive at your door is the new box! We have switched up the design to be more stylish. We want you to feel excited when your Japanese candy box arrives! Another plus! Your Instagram game will be on point since the box is totally Instaworthy! Now, this change is one we have been cookin' up for a while! After reading through tons of feedback, we have launched a new website that provides solutions to many of the concerns our TokyoTreat family had. The website is now streamlined to ensure easier use. Now you'll never feel lost when looking for the newest snacks! Checking the contents of our snack boxes is now much simpler to do. Just check out the new What's In Your Box section! Past booklets have been archived on our website so you can go back and view them at any time you want! Want to know what was in a past box? Now you can with ease! Our Past Boxes page has past boxes listed with what snacks were included. Also, click on the snack and provided link to buy more of a past Japanese snack. Just as our website is evolving, so is the booklet! The booklet is now going to be issued online as the Tokyozine. From now on, an insert will be inside all boxes. This insert will have a unique code that is used to access the Tokyozine where you can find information about all the unique snacks, contests, and DIY snack instructions! This allows us to make the contents more accessible anywhere anytime, while also reducing the risk of booklet information getting lost or destroyed. You can also show off all the drool-inducing Japanese snacks you’ll be getting to all of your friends and family much easier this way! In addition to all bigger, better quality Japanese snacks that will be in the new plans, we also have one last exciting announcement! A new News section can be found on our website! Much of our feedback asks us to provide more content about Japan in general, so we are really excited to provide that to you! This will have news all about Japanese snacks, culture, language, you name it! Your one stop news section to learn all about Japan and feel like your here with us now! Wow, that was a lot of awesome new stuff! We know it might be a lot and that you may have questions. So, for more information about the above changes, please feel free refer to our FAQ. Lastly, we are incredibly excited for all of our TokyoTreat family members to snack on all of the new larger, more flavor packed treats coming your way! We hope you enjoy your snack box as much as we enjoy making it for you! We are always here to answer any questions you may have! Chat with us anytime at weloveyou@tokyotreat.com! Also, a massive thank you to our TokyoTreat family! You are what inspires us to make our service and your experience the best it can be!